We left the coach quietly, idle conversations of the journey overtaken by due reverence to our destination. Wandering the path through well-kept grass speckled by bright red poppies, I entered the red brick building alone. Inside it was barren, empty. Above my head were rusting shower heads. A bath house, a death chamber into which Zyklon B was released to gas people of all ages and diverse backgrounds; naked not for showering, but for swift transportation to mass graves or incineration. Overwhelmed and without warning I sobbed uncontrollably. Leaning on the wall against which the dying collapsed, I pressed my flushed cheek against cold brick as if to self-inflict pain. On leaving the desolation of the chamber to the blue sky, bright sun and rustling trees I trembled, overcome by vicarious grief. Walking slowly I looked across Majdanek where some 80,000 perished, over 18,000 on one November day in 1943. In the foreground stand the huts, fences, watch-towers and the Mausoleum containing the excavated ashes of so many who died. The backdrop is the busy Polish city of Lublin. My reaction to those first moments in a concentration camp has never left me. It was a powerful, overwhelming physical and intellectual reaction to genocide. Born four years after the end of ‘the War’, as we called it, I devoured comic strips of triumphalism, heroism and daring-do. We played ‘commando’ and ‘battle-ships’ … but we never played ‘concentration camps’. We knew nothing of Dresden, nor Hiroshima. We were socialised and schooled in an ideology of victory that all done in ‘our name’ was good and the enemy was, to a man and woman, ‘evil’. Memorialising suffering and loss, be it Majdanek or Auschwitz, Sharpeville or Viet Nam, Flanders Field or the Berlin Wall, is complex. Even when the conflict is recent, those directly involved are alive, their actions caught on film, images and prose fresh in recent memory, and truth commissions or official inquiries are in session, events are fiercely contested. Thirty years on from the Malvinas/ Falklands conflict, the pages of text, hours of broadcast leave the impression that the British campaign was a ‘just war’, fought to protect the greater good rather than to secure political careers. The sinking of the Belgrano and the sacrifice of its many young Argentinian conscripts as it sailed from the exclusion zone has been reduced to an inconvenient footnote in a celebratory discourse of liberation. What we remember, why we remember, how we remember, are matters of profound responsibility. The men in our family were all Merseyside dockers, shipyard workers or merchant seamen. My father was a steward on the Queen Mary. Built as the flagship of the internationally famous Cunard shipping line, it held the Blue Riband for the fastest transatlantic crossing between Europe and the USA. Painted grey, it was used as a troop-carrier during ‘the War’ and steamed alone, leaving the protective shield of military convoys and the hostile U-Boats in its wake. As a child I learned world geography, and associated prejudices, from the tales, the destinations and the adventures of male relatives. Incredibly, they never mentioned the Titanic. Yet it lay deep in their consciousness. It was their inheritance and their worst fear. On 15 April 1912, my Dad was nine and Mum was in her mother’s womb. Built in Belfast, the White Star Line’s Titanic was registered in Liverpool, although it never visited the city. Most service crew were hired in Southampton, the city from which it sailed on its maiden voyage. Many Liverpool families, however, knew someone who died or their extended families. For sure, they did not need a pull-out section of a newspaper, a TV drama or a Hollywood film to inform them that the ship was flawed in design and construction, that its internal opulence belied its structural poverty and that survival, like accommodation, was determined primarily by social class. As I write a spectacular light show, accompanied by music and pyrotechnics, is in full swing at Belfast’s waterfront. It lights the sky. 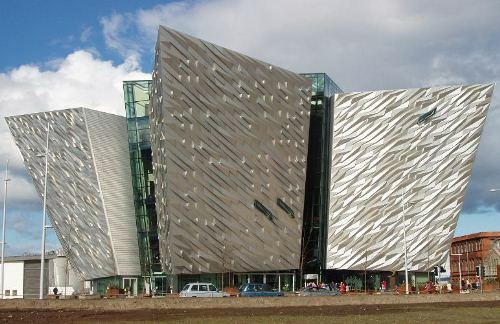 The beautiful Titanic Building, the centre-piece of the city’s ‘Titanic festival’, invites its visitors to ‘re-live the entire Titanic story’. This month every UK newspaper has a special ‘Titanic edition’, the broadcast media is awash with dedicated documentaries, drama-docs and mini-series and the Oscar-laden James Cameron film has been re-released in 3D. From the moment Celine Dion’s rendition of ‘My Heart Will Go On’ became the most requested song at UK funerals and the De Caprio/ Winslet performances tugged at young lovers’ heart-strings, reconstructing the shame of the disaster became its lucrative, financial potential. As punters queue in the frustrated hope of viewing the replica of the ship’s ‘grand staircase’, tragedy begets tourism, investment begets profit. 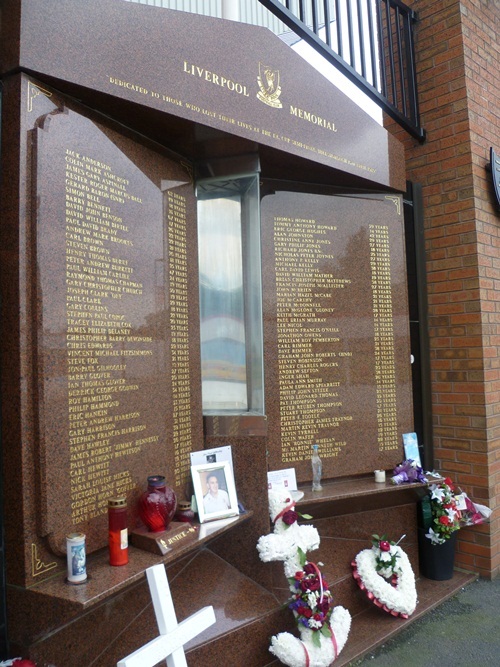 On 15 April 2012, on the famous Kop at Anfield, home of Liverpool Football Club, alongside many thousands of mourners, we will be with the bereaved and survivors of the 1989 Hillsborough Disaster. At 3.06pm we will stand in silence to honour the memories of the 96 men, women and children whose lives were prematurely ended in another foreseeable and avoidable tragedy. It is a symbolic moment of remembrance, an expression of physical closeness and collective grieving. Hillsborough was a deficient stadium, without a current safety certificate, policing and stewarding infected by institutional complacency. The inquiries and investigations that followed, in their failings, compounded the deep sense of injustice shared by the bereaved. As we silently remember those who died, it is inconceivable that such a tragedy will be celebrated in 2089, that people will re-enact in costume and carnival the events that precipitated tragedy. The significance of Madjanek as a site of remembrance is its continuing physical presentation of human suffering. As a shocking memorial to the horrors of genocide, its presence as a place of learning bears witness, defying fading memories and revisionist accounts. Of course, the longer term silence following initial inquiries into the Titanic disaster, and the failure to deliver justice to bereaved families, should be broken – as with Hillsborough. Yet the sensitivity required in dealing with loss and injustice, on whatever scale and whatever the cause, must not be compromised by the ambitions of disaster tourism. Phil Scraton is the author of Hillsborough: The Truth, published by Mainstream. For more on the “Titanic hype” and the debate around tourism and memorialisation, take a look at this article by Eamonn McCann in the Belfast Telegraph. This entry was posted in Memory, Places on April 14, 2012 by Paul Scraton. The whole phenomenon of ‘disaster tourism’, as you aptly call it, is very strange. There is certainly a place for commemorating, and learning from, tragedies but when accompanied by the kind of media frenzy we have had for the Titanic it seems positively ghoulish. I remember going to an island in the St Lawrence Seaway years ago which was where the immigrant ships from Ireland stopped to quarantine those with any illnesses. Many of them died there and went no further. It was one of the most moving places I have visited. However that was before it was made into a tourist site so I do wonder what it is like now. Your moving example demonstrates perfectly the ‘fine line’ between place as a site of memorialisation and place as a site of curiosity. I guess often it’s in the experience and context of the beholder – that two of us standing alongside each other have contrasting emotions despite seemingly sharing the same moment. One of the challenges of this is to place ourselves in other’s shoes. I can only imagine the suffering you describe and I’m sure that for many with an Irish heritage, of whom I’m one, that island will always be a signifier of the Great Hunger in Ireland and the price paid by those who left to escape it -whether we visit it or not. I wrote the piece with some trepidation but was reinforced when I read that many of those who had sailed on the Balmoral to the site of the Titanic’s sinking not only dressed for the voyage but ate the ‘last supper’ served on the Titanic. I accept that among the passengers were descendants of those who perished and they would have had deeply personal reasons for the voyage but the rest of the ‘frenzy’ is something else.